Anime has been a cultural phenomenon in America since it first broadcasted, so many American companies trying to put their own mark on the industry. Using the characterized style of animation we find so homely in anime in western television isn’t a surprise anymore. The popularity of Avatar: The Last Airbender in the states was a formal introduction to young audiences of the amazing culture anime offers. RWBY: Volume 3 hits all the checkpoints for an anime styled show; big eyes, big weapons, and big ideas. RWBY: Volume 3 begins with a heart-wrenching conversation between Ruby and her mother’s gravestone. What a great way to start a show. The course of the show follows with kickass fight sequences, strong friendship, betrayal, and even a little humor. Every episode follows the course of revealing the true intentions of Team BRNZ against Team RWBY and the reasoning behind Cinder’s opposition to his fellow warriors. The truth is slowly unraveled in this dark turn events, only to be unmasked in the contents of the show. Coming into this volume of the show, I expected better animation. I was sadly wrong. Since the shows beginning, the quality has always been subpar, which was understandable considering the shows roots as an online web series. However, considering the success of the show, I was expecting the choppy walking and lacking character design to quickly better. But I was distracted by the well planned battle sequence that made my jaw hit the floor. Although watching fight after fight can be a bit repetitive, with RWBY: Volume 3, each was thoroughly interesting. The storyline of this season was engaging and wasn’t dull in the slightest; with such a successful franchise like this, there isn’t any reason to believe a drawn-out plot could be possible. I found myself engaged throughout the course of the show and didn’t look down from my screen once. When I began watching RWBY, I wasn’t reluctant to like the characters. One of the strong points of the show is the focus on characterization through battles, dialogue, and actions. Volume 3 really fleshed out the true meaning of the word team and brought me to tears with certain acts of vengeance and maliciousness. As the progression of the story continued, the viewer can clearly see the importance of the girl’s dedication to one another. Out of all the given seasons, this one was the one that really grasped me. I watched from start to finish and find it against my personal beliefs to share the earth shattering ending; however I will say that a true RWBY fan will find themselves aching to pick right back up where things ended on Volume 4. In all, this season really hit the mark. A unique spin on a magical girl trend; mixed with monsters, battles, righteous weapons, a dash of romance, and a pinch of friendship, made this a show to watch. Now a day, the anime and animation industry is full of repeats and copycats, but the authentic and genuine purity of RWBY: Volume 3 really made it stand out among the latest shows that have been hitting streaming service. I have no doubt that in the next few days; I will be re-watching my favorite episodes, just to get a second helping of the magic this show contains that I crave. RWBY: Volume 3 asks "anime I?" on Blu-ray Disc courtesy of Rooster Teeth/ Cinedigm. The Disc contains all 12 episodes of the show's third season. The show has been letterboxed at 1.78:1 and the Disc contains an AVC 1080p HD transfer which runs at an average of 29 Mbps. The image is very sharp and clear, showing no grain or defects from the source materials. As this was originally a web-based series, the HD transfer does show some issues, most notably blurring when the characters move quickly. The colors look very good and the image is never overly dark or bright. There is a lot of depth here, creating a faux 3D effect. The Disc carries a Dolby Digital 5.1 audio track which runs at 48 kHz and a constant 384 kbps. The track provides clear dialogue and sound effects. Despite not being a lossless track, the audio is nicely layered, as the sound effects and music work together. The stereo and surround effects aren't overly pronounced but they provide depth. 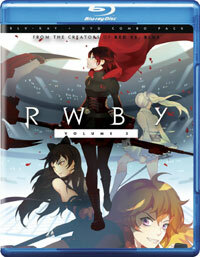 The RWBY: Volume 3 Blu-ray Disc contains a handful of extras. We begin with an AUDIO COMMENTARY featuring Directors Kerry Shawcross, Miles Luna, Gray Haddock and Producer Koen Wooten. This is followed by a second COMMENTARY which has actors Lindsay Jones, Samantha Ireland, Kara Eberle, Barbara Dunkelman, and Miles Luna. We then get a third COMMENTARY with Art Director Patrick Rodriguez, Concept Artist Erin Winn, Modeler Tim Reed, Compositor Robert Reynolds, Sound Designer David Levy, Co-Lead Animator Dustin Matthews, and Animator Harley Dwortz. "3, 2, 1, Begin!" (14 minutes) has the creative team discussing the thought processes behind the look and feel of the show's fights. "No Heroes in the End" (14 minutes) is an overview of the story, characters, and themes, paying attention to the important moments in the show. "Let's Make a Show: The Legacy of RWBY" (9 minutes) has the team discussing the origins of the show and how it was created. "CRWBY Photos" offers portraits of the team behind the show. "World of Remnant" (14 minutes) is a four-part series which offers a side-story for the show.